These cute little pancake skewers are the perfect Christmas morning breakfast or addition to a brunch buffet. They are easy to put together and are a great, mess-free way to serve pancakes. 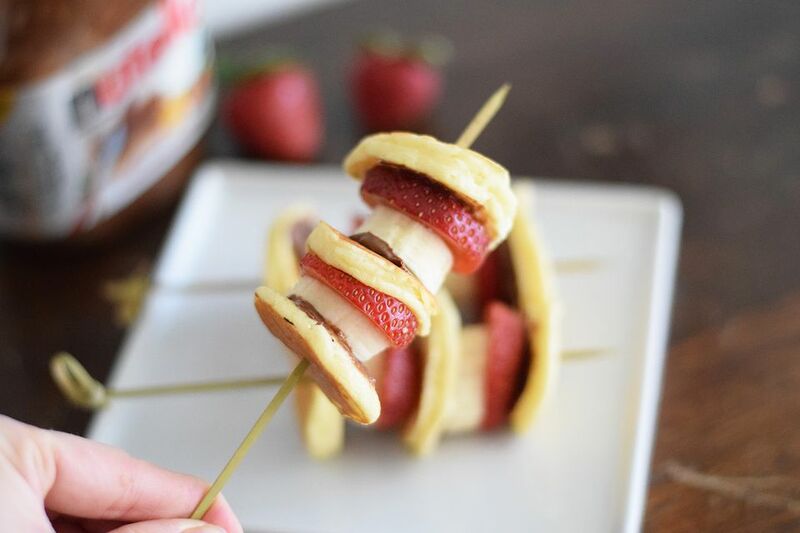 Nutella hazelnut spread makes these pancake skewers especially delicious, but you can also substitute with a drizzle of chocolate syrup or peanut butter or jam. You don't need any silverware, plates or sticky syrup. Well, maybe some syrup is needed! You can assemble them pretty quickly on your own, or you can make it a family affair and have everyone chip in to create them together. Just take care to make them right before you are ready to serve, as they shouldn't sit out too long, because the pancakes will become soggy. Place them on a pretty platter so they can easily be grabbed at your party or brunch, and voila! There is a recipe for the pancakes below, but you can also use a ready to pour mix or your own pancake recipe. You could also replace the regular pancakes with a red velvet pancake or a chocolate pancake. The choice is yours! Whisk together the eggs, milk and butter in a measuring cup or small bowl. Make sure the butter has cooled to room temperature before whisking it in with the eggs. (Hot butter can scramble the eggs.) If you are adding vanilla you can also add it at this time. In a large bowl sift together the flour, baking powder, sugar and salt. Gradually add the wet mixture to the dry mixture, being careful not to over mix. Make sure the batter is completely moistened. Heat a griddle or non-stick pan on medium heat and grease with butter. Make sure to monitor the heat of the griddle so that you don't burn the pancakes. Turn down the heat if you need to as the griddle holds heat very well. Pour 1-inch circles of batter onto the griddle using a small ladle or a large spoon. Cook for 1 to 2 minutes and flip until golden brown on both sides. Remove the pancakes from the griddle and place on a plate in one layer. Spread about a teaspoon of Nutella on each of the pancakes. Add a pancake with the Nutella side facing up onto a bamboo skewer. Add a sliced strawberry and a sliced banana. Add another pancake, strawberry, and banana slice. Then place the final pancake, but with the Nutella side facing inward. Repeat with the rest of the skewers.